Annmarie Skin Care > Healthy Lifestyle > Tired All the Time? Take a Closer Look at Adrenal Health! Calling all hypochondriacs! I have something new for you to worry about. It’s your adrenal glands, and they are tired of what you are doing to them! Our adrenal glands handle our stress response, including the production of the hormones such as adrenaline, DHEA, and cortisol. This system has evolved to handle short bursts of stress. Back in the good old days, all you had to do was wake up, find something edible, and maybe dodge a saber-toothed tiger or two. The life! Now we often experience daily stress, sleep deprivation, and a poor diet supplemented with stimulants like caffeine and sugar. Let’s keep in mind the amazing power of stress to help us react to problems in our environment. When stressed, our pupils dilate, our heart rate increases, our blood sugar rises, and our blood even clots more quickly! I’m feeling like a superhero right about now! But you can’t save a cat from a burning building every day. And our body’s response to stressers like traffic, job pressure, and financial struggles are practically identical to what we experience during a life or death crisis. Check out this TED talk for a really fascinating perspective on stress. Adrenal Fatigue Syndrome characterizes the symptoms that result when your adrenal gland fails to respond to your pituitary gland’s request for hormone production. It hasn't had time to recover. So it’s no wonder we find ourselves chronically fatigued. This syndrome can be hard to pinpoint. Many of the symptoms are associated with other conditions. Symptoms like cravings for salty and sweet foods, irritability, frustration, feeling run down or overwhelmed…who hasn't felt these things before? Some say this fatigue is just the natural result of a busy lifestyle and poor diet. How do we know when the condition has escalated to actually affect our hormone production? The thing about our adrenal system is that it naturally runs on a 24-hour cycle, providing us energy in the morning that tapers off as the day goes on. This is tied to our circadian rhythm. When you feel sleepy and you reach for that cup of coffee in the afternoon, your adrenal gland gets an unnatural boost. This can result in trouble sleeping later, or a general disruption in your hormonal release pattern. Eat within an hour of waking up in the morning. This signals your body that it’s go time! Don’t let your body get too hungry. Hunger creates stress in the body. It says, “Ok, it’s time to feed me! Let’s mobilize!” Instead, aim for a few small meals or small snacks throughout the day. Include protein in every meal to keep you full longer, and complex carbohydrates to balance your blood sugar. While you’re at it, try to stick to foods low on the glycemic index. Go to sleep when you feel sleepy at night. Ideally, around ten. This can be hard to sync with your lifestyle, I know! But people with adrenal fatigue sometimes experience a second wind around 11:00 p.m. that might be caused by a small increase in cortisol levels. The result? You have trouble falling asleep when just a mere hour ago you couldn’t stop thinking about your pillow. Avoid stimulants! People with adrenal fatigue often need coffee to get them going in the morning. And then again around 2:00 p.m. And then maybe some chocolate around 4:00 p.m. Sugar fits into the stimulant category as well! Ever notice that when you are more tired, you experience more sugar cravings? If coffee is important to you, try to limit it to the morning, after you have eaten something, and keep it to one cup. Exercise. It makes everything better. You don’t need to commit to a marathon just yet, but getting your heart rate up a few times a week is key. Manage stress. I’m telling you, the TED talk I mentioned before will change how you think about stress. 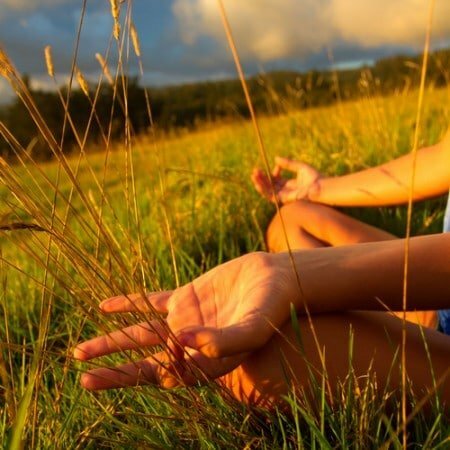 Habits like stretching, meditation, or practicing yoga are always mentioned as stress reducers. It’s because these tactics help a lot of people reduce their stress. The modern lifestyle can take a lot out of you. Quitting your job and moving to Tahiti may not be an option just yet, but managing your stress levels and restoring your natural energy patterns may help you take a load off your adrenal glands. As always, I encourage you to do your research and remembering that positive thinking is a key ingredient in any health regimen. Do you experience a lot of fatigue? Have you been diagnosed with adrenal fatigue? Please share your story. Read the book, The Hormone Cure, and I know many of my symptoms for low thyroid, adrenal fatigue, and hormone imbalance. Feel like I am a mess. Had all tests done and Dr. said I am normal in all areas. In fact she said I am in great health. No drugs of any kind except Bio identical hormones. Too low estrogen. Tried L Tyrosine, and 5HTP and do not like how I feel on them. Tyrosine makes me feel jittery and fuzzy, and 5HTP keeps me a wake all night. Together taken in am, I am off the wall! Too stimulated I think. Always tired when first get up, and go for coffee and coconut oil in coffee, helps a lot, but no appetite till lunch. I have low temperature of 35.4 first thing in the morning, and low blood pressure all my life. Diagnosed with Fibromyalgia because of all the pains in many places, and chronic fatigue. My Pharmacist upped my Bio Identical estrogen because I am below normal for my age. 64. My Progesterone is 75 ml 30 mg/0.25ml GB My new estrogen is 25 ML Biest 1.25 mg/0.25 VB What ever that means. Reading the book I know I have to take care of my adrenal fatigue first, going to change the diet, Monday following the 21 Day Hormone reset Diet, by Sara Gottfried. Can you give me a contact for someone in Edmonton, AB who has a masters degree in health and Nutritional Medicine? Really want to get myself balanced. I exercise and eat right for the most part. Coffee and sugar are my addictions. Thank you for listening and any help you can offer.